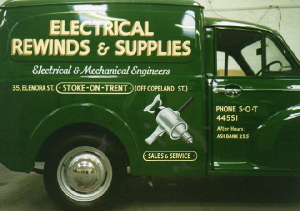 Traditional signwriting is perfect for heritage vehicles but modern styles can just as easily be achieved. Here is a mixture. 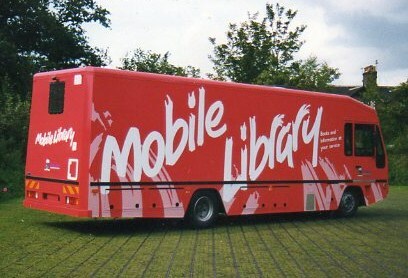 One of several Library vans all of identical design but varying colour schemes I did for Charles Bailey Bodybuilders of Knypersley. Painted by hand with a large brush using tape to assist with longer, straight runs. 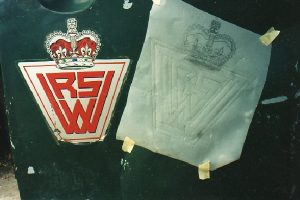 This is the original door from an old Morris Minor Van depicting the faded and peeling RWVS sticker and my pounced tracing of it. The owners hired John Cliffe, an ex-workmate of mine who has a body-shop spraying vehicles new and old - to restore the van to its former glory. Replacement doors were fitted to the van, John restored and resprayed the whole vehicle body. 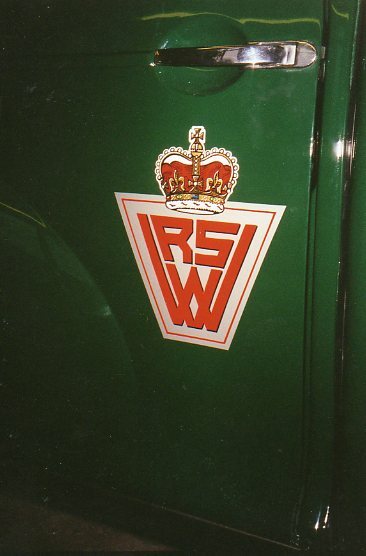 And I was given an old door to use the old RWVS logo sticker as a template for the new ones, which were to be signwritten and gilded by hand onto the new doors. Firstly, I masked out the trapezoid shape and sprayed it silver using car aerosol paint. Next, I double coated the white background to the crown. Then I transferred the 'image' onto the work from the tracing. Next, I gilded the crown using transfer gold leaf, varnished it and added red enamel to lettering and crown. Then, the jewels were painted in and then the whole crown outlined, and lettering shadowed in black enamel. Finally, I dabbed highlights here and there in white enamel. Nice little job. 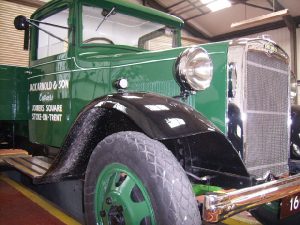 John Arnold - the vehicles owner had this 1933 Morris C Type truck meticulously restored right down to having the 'Morris Commercial' badge above the grille - professionally re-enamelled in its original colours. 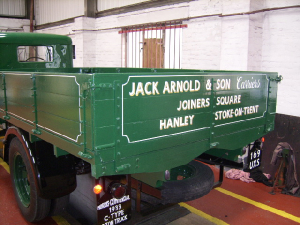 'Jack Arnold & Son Carriers' were never actually a trading company. John just wanted this as a memory of his late father Jack. Another bloody green van:-) Quite a long, involved job but in the end - one of my best. 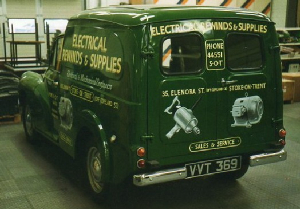 This Morris van was restored and is owned by 'Fletcher Bickerton Manufacturing Co'. of Stoke on Trent. The lettering style and the van itself closely resemble the original - possibly from as early as the 1950s. An old b&w photo of which was supplied for me to work from, the colours were improvised. I hand-painted the 'motor' and 'hand-drill' pictures from very old, poor images. 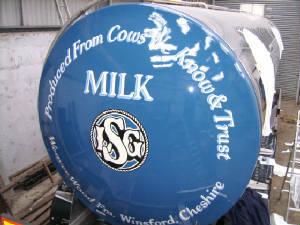 This new milk tanker is Steve Salmon's latest vehicle to be signwritten in addition to a previous two tractor units and trailer. 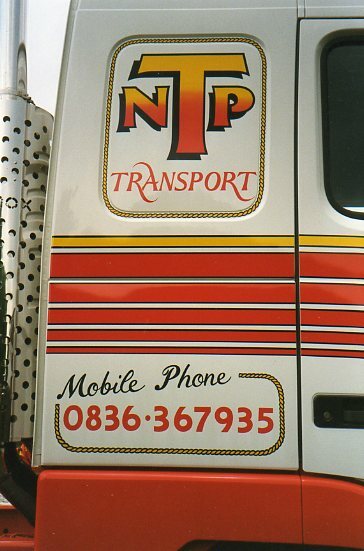 For the sides of the vehicle Vinyl lettering was provided, which I fitted. This horse-drawn carriage was lettered in gold leaf and protected with varnish. Original artwork was supplied by the owners, which I copied to the bodywork. Something not very evident in the photo is the coach-lining, which adorns the body, chassis and cartwheels. In addition to the lettering is the coachlining. In this instance I often 'cheat' by using lo-tack tape to form the outlines, then just paint along the gap and peel the tape off. It's quicker than the traditional method of dragging a fine, long haired brush along the bodywork using your outstretched finger as a guide, which takes a lot of skill. Smaller connecting curves and details are still painted in by hand. The drill image was particularly bad, but with sketching help from another employee - I was able to come up with what you see here. I think that this vehicle depicts the era very well, and although I probably wasn't even born or at least was very very young - there is something in the style which I find intensely nostalgic and comforting. Note: The 'three digit' after hours phone no. on the cab door. Fewer owners of actively commercial vehicles opt for painted signwriting in favour of self-adhesive vinyl. 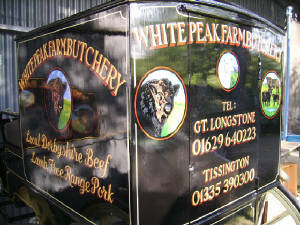 Even with more advanced materials and computer graphics, I believe you can't beat traditional signwriting.